I have been working on the riddle for the past couple of days. I got one tree finished (after frogging the dumb branch about 10 times) and part of the house. I am loving this project. I love the colors and the fabric and the silk threads. My dh took my older boys golfing and Matthew is taking a nap (kind of late, but I'm not complaining), so I'm going to get back to stitching! Hope everyone is having a Happy 4th! Write soon! It's coming along nicely. Don't you hate that frogging? Can really put you off a piece because of it. Keep going though, it's lovely! Nicole, this is just so lovely! I of course have this chart -- and you're so inspiring! I love the colors!!! Hope the frogs stay away from now on! This is so pretty Nicole! Beautiful progress! I also like the color of fabby and threads too! I love this piece. You made some very nice progress on it. I've always loved this piece and yours is looking beautiful! Oh Nicole, It's truly a beauty! I'm going to pretned that I didn't see it, because I think I need to do it now. I love it:) it's coming be gorgeous! Oooh how pretty. I love the flowers along the bottom. 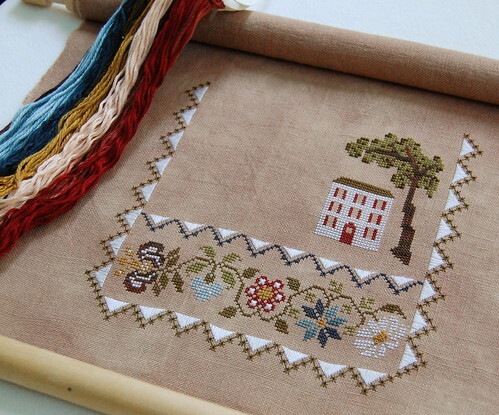 This is really a pretty sampler. I love DT designs, but I especially love this one because of the colors. Hopefully, the frogs will stay away for the rest of the project. Oh, man. I shouldn't have looked!! LOL I loved The Riddle when it came out but thought I wouldn't stitch it. Seeing your WIP pics are making me drool! I might just cave. Beautiful work. I love love love your Scatter Freedom, too! That row of flowers at the bottom is gorgeous! Love the colors, and you do an outstanding job of photographing your work. I'm enjoying watching your progress on this one.